An interesting, personal and meaningful exploration of the character zai 災 and its variant in the Shanghai Museum Manuscript of the Yijing by my good friend Luis Andrade. Translated: fu 孚 is a differentiation/modification of bao 保. The earliest version of bao does not look similar to the earliest form of fu, but the forms that we find on bronze inscriptions contain the same elements: a hand or person covering/protecting a child (see the forms marked in red in the image on the right). The right part 呆 of the character bao is the early version of the character (without the 亻part), it is another version of 孚 and 俘 is often written as 保. To be more precise, 呆 is written as 𤓽 in bronze inscriptions, which according to the Shuowen is an old form of 孚.
I always feel a little bit uncomfortable with these constructions – it looks like a derivation of the Six Degrees of Separation, as if you can turn a Chinese character in any other character by following a trail of variant forms. But looking at the old forms of 孚 and 保 I think it is very well possible that 孚 can be read as 保. We do not have 有孚 in old texts, but we do have 有保 on oracle bones. 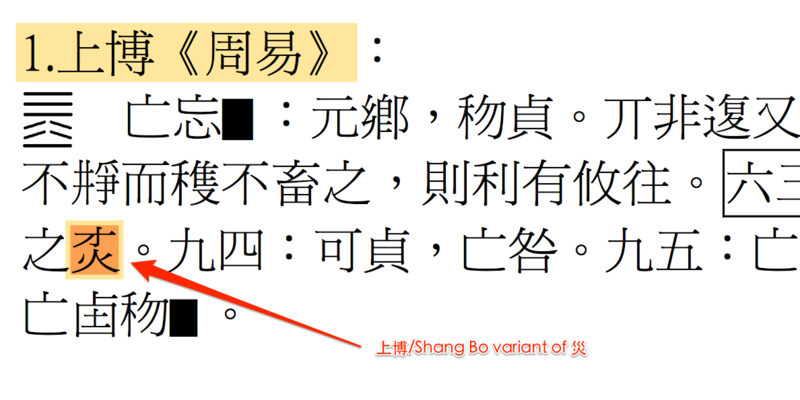 In several inscriptions it is said that (貞)有保, ‘(the divination) has bao 保’ (see image for an example; Heji 06572). What does bao mean? The 新编甲骨文字典 dictionary by Liu Xinglong 劉興隆 explains it as ‘保佑’, ‘保衛’: ‘to bless and protect’, ‘to safeguard’. It meant that the preceding offering to the ancestors or spirits was accepted and that therefore the ancestors would give there blessings and protection to the king – affairs in the (near) future would go smoothly. You fu appears often in the Zhouyi (at 5-0; 0=Judgement text, 6-0, 8-1 2x, 9-4, 9-5, 17-4, 20-0, 29-0, 34-1, 37-6, 40-5, 41-0, 42-3, 42-5 2x, 45-1, 48-6, 49-3, 49-4, 49-5, 55-2, 61-5, 64-5). If we read it as you bao 有保 it implies a positive outcome: you have support of the spirits and things will go as planned. The oracle bones show that you bao can also mean that you have support of allies. In ancient China the support of the ancestors, spirits or allies was essential, undertaking any action without their consent was doomed to fail. If you receive you bao it means you can proceed as planned, but if you do so you must acknowledge, respect and show gratitude to the forces that are aiding you in this. If you don’t do that you will loose their connection which makes it very difficult to accomplish anything in the future. With you fu/bao you are on the right track (literally in 17-4, 有孚在道, ‘there is protection on the road’) but you have to check the powers that guide you regularly to maintain the right course. Naturally the Yi is a great help in this. The reading of fu as bao in relation to the Yijing is much better and more extensive explained by Xie Xiangrong 谢向荣 in his article 《周易》“有孚”新论 which can be downloaded here. Highly recommended.